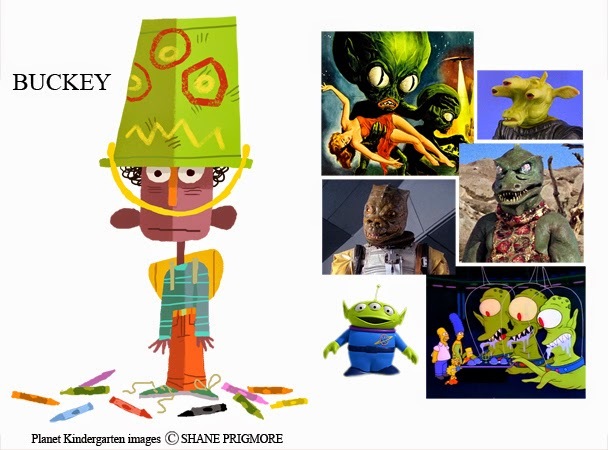 “We’re aliens from many galaxies on Planet Kindergarten.” This was author Sue Ganz Schmitt's inspiring, but only description of a large portion of the characters in her book, PLANET KINDERGARTEN (Available now!). As explained in my first PK post, the book equates a child’s first day of Kindergarten to an astronaut visiting an alien planet. The idea was not to be overtly literal with the space visuals, but to make things in our world feel symbolic, or representative of space. Chronicle Books decided that I would be the person to explore the possibilities, and as the illustrator of the book the first thing I did was play with the characters. No visual description of any character was given in the book, so they left that to me. Lets start with the main character of our story (above)…. a nervous but determined little boy who approaches life with the focus of a NASA Astronaut. In order to hone in on what he might look like, I started to research everything NASA. In doing so I was obviously inspired by the astronaut’s uniforms, suits and gear, but I also pulled inspiration from NASA spacecraft and symbols as well. For example, the overall body shape of the main character was inspired by a specific NASA space capsule. 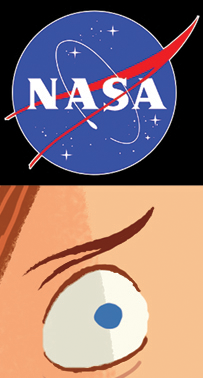 I even designed his eyebrows to reflect the red, jet stream swish in NASA’s emblem. I also gave the characters broad graphic shadows inspired by images of planets (and our own moon)lit on one side by the sun. These are not things that I expect the viewer to see blatantly. These are just elements that inspired me to design a character that was hopefully more specific, unique and relevant to THIS particular story. A viewer might “feel” these elements subliminally. Creating a visual “feel” inspired by things relevant to the subject matter and tone of the story is important to me. I don’t just design something to “look cool”, I want to design something that is relevant to, and inspired by the story….and hopefully that is what’s cool. 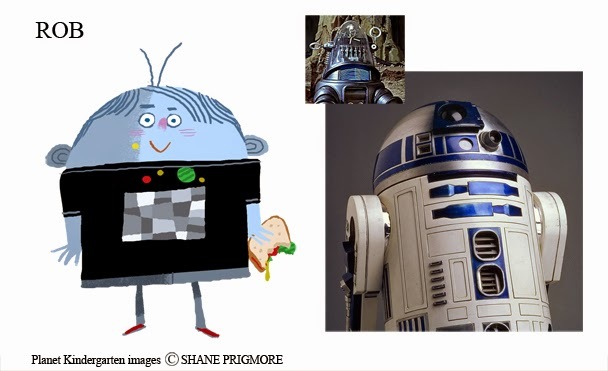 Next I started exploring the classmates that our “astronaut” would encounter in our story. Inspired by the text, I thought about how I might portray these kids as “aliens”. Here are a few of my solutions, along with their inspiration. I gave them names for my own benefit (and for fun). 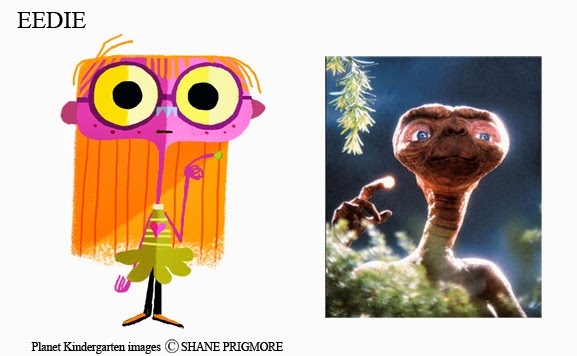 EEDIE: A wide-eyed, awkward, nose picker, Eedie was inspired by one of the most loveable and unusual aliens of all time. I imagined that Eedie picks her nose as a way of coping with events such as this first day of kindergarten. In the book I had her keep the booger throughout the day, as a kind of comfort… a small, reassuring companion of sorts (like Wilson is to Tom Hanks in Castaway). 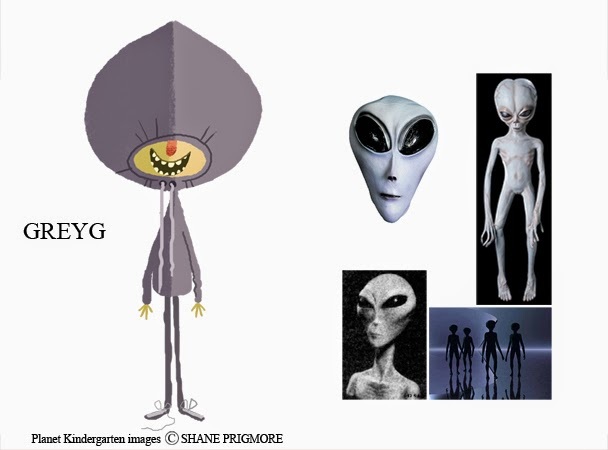 GREYG: I definitely wanted a classmate to represent a classic Grey Alien. Another kid trying to cope with his first day of Kindergarten, Greyg hides under the tightly drawn hood of his grey sweater hoping that, if he can’t see you, maybe you can’t see him. I geared his overall silhouette to feel like the large headed, thin-bodied aliens we have all seen represented and described for years. BUCKEY: A highly imaginative but shy kid, his first day of Kindergarten begins with finding the class crayon bucket and creating a new persona. Buckey was loosely inspired by several of my favorite classic green “monster” alien types from science fiction lore. 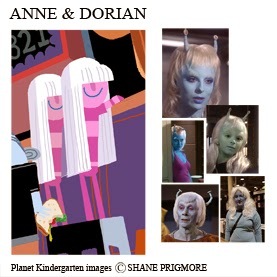 ANNE and DORIAN: These petite, white haired twin sisters were inspired loosely by the Andorian aliens from Star Trek. They are lucky to have each other on their first day of Kindergarten, but potty breaks and recess activities pull them apart from time to time. ROB: Not able to wait until lunchtime, Rob messily eats his mustard, catsup and pickle sandwich. The ingredients now dot the front of his shirt (and face) like the small buttons and lights of a classic sci fi robot. Those are some of the kids you’ll encounter on PLANET KINDERGARTEN. I’ll share a bit about the thinking, and inspiration for the environments and world of the story in my next PK post. I look forward to sharing. I wish everyone Happy Independence Day !! Great work with a ton of high quality content and easy to follow. Bigg boss 9 adult posrn star Mia khalifa is in? Top 10 Bigg boss 9 Contestants; Hosted by Salman Khan. this is very Nice thanks for sharing with us! I just want to celebrate halloweens and want you to join us in our family. Thank you so much for this article. I've been looking for it :) It will helps me much. I think that humans are at the threshold of entering a wider community, more universal. After proving that the earth, sun, and the galaxy is just typical science must also solve the problem of our species is just typical or not. We lack definitive absolute certainty that we are not the center, within the meaning of the most important word - until somebody confirm the existence of intelligent beings elsewhere in the universe.! This is not the only example of UFOs in ancient art. There have been hundreds of examples of the many flying objects painting stretching over many centuries. Strangely, most of the paintings depict UFOs are connected with a spiritual figure or a certain experience. It is possible that the creator of these paintings to explain what they have seen or perhaps a literary connection between spirit and UFO.! below an individual goy the particular defeat holiday along with happy new year 2016 wants go here out people: --. Red Ball is a online, platform games series, posted by King. It involves a red ball 3 stuck in a world of various levels, and hola launcher apk is a freemium web and mobile application which claims to provide a faster, private and more secure Internet . Whether you are looking to improve your culinary skills or you simply love whipping up tasty treats, this simulation game named cooking fever game will surely leave your mouth watering. Sun, sand, surf, and all the fish you can eat! Sail away to paradise bay king, where you'll help Keani and friends restore the island to its former glory. The and, agar io is a fun addicting MMO game in which you have to eat or be eaten while you strive to dominate the World of colorful cells. Good happy !